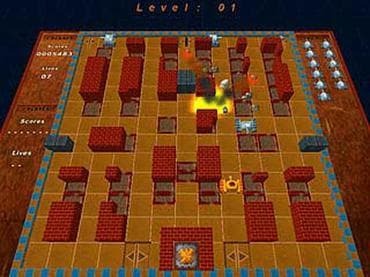 Play this free Battle City game with 3D graphics. As in the original game, you must destroy all enemy tanks and defend your base from annihilation. The game is build up on the basis of a well-know and loved by many users Battle City game, with application of 3D technologies. The action takes place on the arena, where you and your enemy appear. You drive a tank, and your aim is to destroy all enemy tanks and defend your base from annihilation. There are several obstacles on the arena which can be very useful for you in the battle, but on the other hand, they can also hinder you. From time to time bonuses, giving you various opportunities, appear on The arena: you can blow up your enemy's tank, you can stop your enemy's tank, you can modernize your tank, etc. Besides an enthralling gameplay, there is a possibility for two users to play the game from one computer. In this case, two tanks will appear on the arena, and the users will be able to defend the base and destroy the enemies together. Download free full version game today and defend your base! If you have questions about Battle City game, please contact us using this form.